Starting in 1970 radioisotope powered pacemakers were implanted in over 3000 patients worldwide. These devices had longer lifetime power supplies than battery powered pacemakers therefore eliminating the need for battery replacement surgeries [1, 2]. A thirty-one year study performed by the Newark Beth Israel Medical Center of 139 patients showed that nuclear-powered pacemakers required less surgeries than a control group of lithium battery-powered devices . This same study showed that cancer rates for patients with nuclear-powered pacemakers were similar to a control group with battery-powered devices . The feared increased cancer rates did not materialize [1, 2]. With improvements in modern electronics technology and improvements in semiconductor energy conversion efficiency, radioisotope pacemakers can once again reliably provide pacing services for patients whose life expediencies are greater than twenty years, reducing the need for invasive surgeries to replace batteries. A new generation should be developed. A radioisotope power source takes the heat from the decay of a radioactive substance and generates heat through some sort of thermal energy to electrical energy conversion process using either the thermoelectric effect or thermionic effect [1–4]. Pacemaker devices of the 1960s had short battery lives, ranging from twelve to eighteen months [1–4]. A proposal was made to use radioisotope power sources which would have longer lifetimes and require less surgery since each time a battery had to be replaced surgery was needed. The Atomic Energy Commission had a guideline for 90% device reliability over ten years . Several manufacturers developed nuclear-powered pacemakers using either thermoelectric or thermionic power conversion systems [1–4]. Two isotopes, Pu-238 and Pm-147, were chosen as the heat source [1–4]. The amount of radioactive material in each device ranged from 0.105 to 0.40 grams . A majority of the developed devices used Pu-238 due to its 87.7 year half-life [3, 4]. In previous experiments Pu-238 capsules of 30–50 grams were implanted within dogs to test for carcinogenic effects. These experiments showed no significant change from a control group [3, 4]. There were members of the medical community that did not trust those experiments and believed that the prolonged exposure to implanted radioactive materials would cause cancer . However, this did not happen. In a long term study the rates of cancer in two control groups, one with nuclear-power pacemakers and those with battery-powered pacemakers, showed no statistically significant difference in cancer rates over thirty-one years . 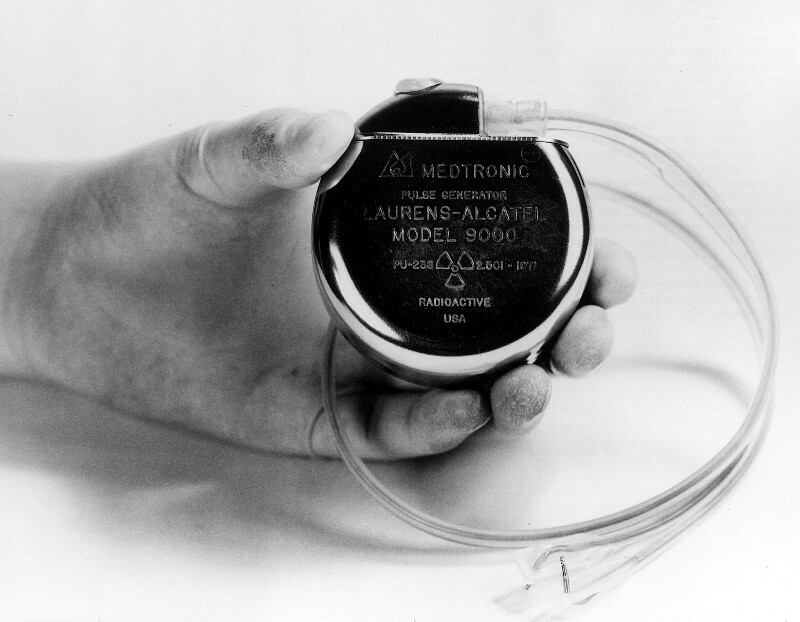 The major drawbacks to the nuclear-powered pacemakers were the availability of nuclear fuel, the excessive size compared to other pacemakers of the period, and the stringent FDA and NRC regulations compared to non-nuclear devices . If nuclear-powered devices were developed using modern electronics technology the size would be smaller. However, the strain on Pu-238 sourcing would be significant since neither the United States or Russia is producing any currently for commercial use, but there are other isotopes such as tritium that could be used that are widely available and would not require as much regulation . The original motivation for nuclear-powered pacemakers was the need for a pacemaker power source that lasted longer than a year to eighteen months [1–4]. However, this is not as much of a concern with today’s pacemakers. With new lithium batteries, modern pacemakers have an expectancy of around ten years . While this is an improvement, an otherwise healthy individual in their early forties might have as many as four battery replacement surgeries within their lifetime. This is where a new generation of nuclear-powered devices will be useful. It will enable a long-term patient to require less surgery. The results of three decades of tracking patients reveal that nuclear-powered devices worked well. The study performed by the team at the Newark Beth Israel Medical Center was revealing. Over fourteen years they implanted and tracked the progress of 132 patients [1, 2]. Of these patients, twelve needed surgery because they needed mode changing, and the devices they had implanted did not have the ability to be changed remotely [1, 2]. Power failure occurred in only one case [1, 2]. Fifteen were removed because of component malfunctions and eight units because the high pacing threshold had been passed [1, 2]. After fifteen years, the survival rate was 99% for the power systems and 82% for the entire pacing system [1, 2]. The malignancy rate was similar to that of the normal population and tumors were not concentrated around the pacemaker as had been feared but randomly distributed as in a normal population [1, 2]. From the study by the team at Newark Beth Israel Medical Center a few conclusions can be made. First, nuclear-powered pacemakers are a reliable power source for pacemakers. The failure rate over fifteen years was less than 1%, which was better than the NRCs recommendation of 10% over ten years. Second, the fear of increased cancer rates that had been mentioned by Hart, the FDA, and the NRC proved to not materialize. The exposure to low-levels of chronic radiation was not a concern. Third, the exposure to radiation for patients was well within the limits that the NRC has set up for workers in nuclear sites [1–4]. According to EW Webster, as mentioned in the 2006 paper by Parsonnet, the requirement for the use of a fluoroscopically-controlled replacement for battery-powered pacemakers would expose the patient to 1.6 times as much radiation as 15 years of pacing using a Pu-238 powered device . As of May 2004, twelve of the 139 patients were still being followed, and one patient still had their original pacemaker thirty-one years later . Two other major studies reached the same conclusions with regards to the safety and reliability of nuclear-powered pacemakers and therefore the Newark Beth Israel Medical Center can be considered a good survey of other studies . Nuclear-powered pacemakers were successful. The major drawbacks of the technology were that nuclear-powered pacemakers were larger than the battery-powered devices of the era, the surgeries required for replacing the pacemakers due to pacing problems, and the regulations and risks involving handling of nuclear fuel . With improvements in pacemaker technology the first two drawbacks would be significantly reduced. Pacemakers electronics are much more advanced than in the 1970s. The concern that Hiram Hart and others had concerning increased cancer rates never materialized and therefore should not be a concern in the future when considering whether this technology should be revisited. There is also a modern solution to the drawback of nuclear fuel handling. There has been improvement in betavoltaic devices over the past forty years. These devices had been originally considered as a power source for pacemakers in the 1970s [3, 4]. Betavoltaic power sources use b particle decay as method of generating current as opposed to a decay found in Pu-238 devices. Early semiconductor devices were not well suited for b decay power conversion and this was a major reason why Pu-238 was chosen. However, semiconductor energy conversion technology has improved since the 1970s and there is once again renewed interest is using the technology for long-term, low power needs . While early betavoltaic pacemakers used promethium as an isotope, the increased efficiency of energy conversion technology has enabled the development of betavoltaic devices using tritium, an isotope of hydrogen, and other less radioactive substances as the energy source . Using less radioactive isotopes could allow for a reduction in the regulatory framework that the NRC and FDA has imposed on nuclear-powered pacemakers. This would reduce the costs associated with production and ultimately the disposal of the device, both of which had been major costs due to the specific handling requirements of Pu-238 and promethium. Nuclear-powered pacemakers have a successful history of providing long term, reliable power to pacemakers with similar side effects that of a battery-powered device. With improvements in modern pacemaker electronics technology and improvements in semiconductor energy conversion technology the time had come to revisit the use of radioisotopes as power sources for pacemakers, particularly with patients who are expected to have multi-decade survival timelines. While using Pu-238 would prove a hassle due to the lack of supply and stringent regulations, developing betavoltaic-powered pacemakers would be a logical course to take. Tritium is widely available in seawater so the main issue would be making sure the size of the tritium storage is the size a battery would use in a pacemaker. This is because tritium’s half-life is only 12.5 years, but two packages of tritium could be used in sequence to extend the lifetime to twenty-five years . If less radioactive isotopes could be used in modern nuclear-powered pacemakers the regulations could be revisited, simplifying the process and therefore reducing regulatory costs. The advancement in pacemaker electronics technology would mean that there will be less pacemakers replaced due to pacing and lead problems that occurred in the ones implanted in the 1970s and 1980s. Developing long-term pacemaker power solutions using radioisotopes would once again allow patients, particularly those who may have a pacemaker for forty years or more, to reduce the frequency of surgery. Over a multi-decade length of time, this could potentially reduce the cost of the pacemaker since there would not be a required surgery every ten years or so. The fears of radiation causing cancer was proven to be false by the first wave of nuclear-powered pacemakers and a new generation of devices would be able to use improvements in energy conversion technology and pacemaker technology to allow for more efficient and reliable devices than the first generation. Parsonnet V, Berstein AD, Perry GY. The nuclear pacemaker: Is renewed interest warranted? The American journal of cardiology. 1990;66:837–42. Parsonnet V, Driller J, Cook D, Rizvi SA. Thirty‐One Years of Clinical Experience with “Nuclear‐Powered” Pacemakers. Pacing and clinical electrophysiology. 2006;29:195–200. Huffman FN, Norman JC. Nuclear-fueled cardiac pacemakers. Chest. 1974;65:667–72. Norman JC, Sandberg Jr GW, Huffman FN. Implantable nuclear-powered cardiac pacemakers. New England Journal of Medicine. 1970;283:1203–6. Hart H. Nuclear-Powered Pacemakers. Pacing and Clinical Electrophysiology. 1979;2:374–6. Association WN. Plutonium. World Nuclear Association; 2017. Mallela VS, Ilankumaran V, Rao N. Trends in Cardiac Pacemaker Batteries. Indian Pacing and Electrophysiology Journal. 2004;4:201–12. Bourzac K. A 25-Year Battery. MIT Techonology Review: MIT; 2009.